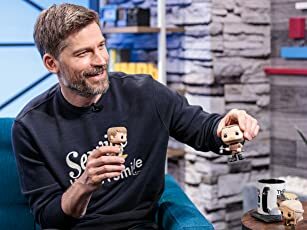 Quiz show. Stephen Fry investigates jargon with Victoria Coren, Bill Bailey, Jimmy Carr and Alan Davies. Stephen Fry forges forward into the future with Sean Lock, Rob Brydon, Ben Miller and Alan Davies. 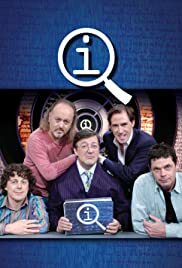 How many episodes of QI have you seen? Stephen Fry: [quoting Albert Einstein] Only two things are infinite - the universe and human stupidity, and I'm not so sure about the universe. Q: What is visible in the opening sequence? Q: Has the answer ever been "Blue Whale"? The epitome of the comedy quiz show. Back in the 60s this genre was handled best on the radio by I'm Sorry I'll Read That Again. There have been several TV attempts to revive that format and this one gets it absolutely right. The best description I have seen is like a really fun dinner party. The quiz part is still central, the questions are real, the answers are real, the points scored are real, but the time is largely taken up by the banter triggered by the questions. The questions frequently have obvious, "everyone knows", wrong answers which receive a klaxon and a big forfeit and triggering this is occasionally the point of the question. You're sitting down for an evening with 5 really smart, really quick witted, really comical people playing the pub quiz from hell and you're along for the ride. Wonderful, and archetypally British, entertainment. Some adult humour, some disrespectful humour, some irreverent humour, lots of good natured teasing, and you still learn something. Great.